We were impressed by this house built in 1926 because it was made to blend right in with the much older stone wall to its right. 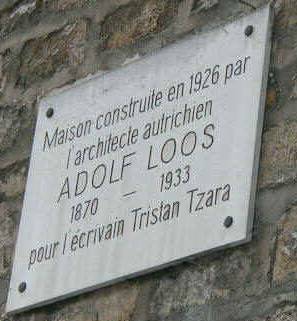 The architect was an Austrian named Adolf Loos, and the house was built for the writer, Tristan Tzara. 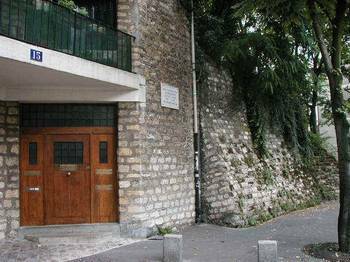 The older stone wall next door is where a kindly old man named Françisque Poulbot used to live. He made a playground for neighborhood children in his garden. 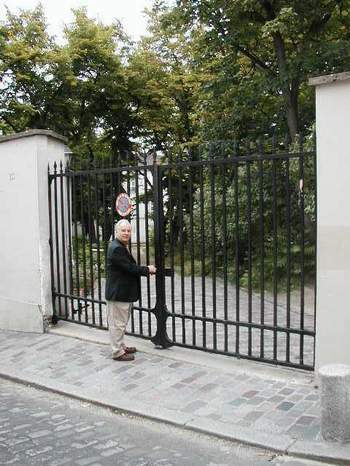 A little farther down the street, Tom took a liking to this chateau because of its fine looking grounds and gate. Here, he fantasizes that he has the key . . . .
Also on Avenue Junot, we were surprised by this sign that says, "Beware -- residence under control of electronic rays and master dog." 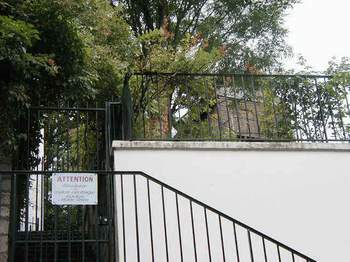 When we studied the place, it became clear that the wood frame building on the right on the grounds of this residence is actually one of the old windmills. The neighbors saved it from demolition in 1979. According to a guidebook that we bought this year, the property is protected by a high voltage electric fence and is electronically watched by radar. The mill is the Moulin de la Galette, the one made famous by Renoir with his painting of the same name. The original name of this mill was "Blute-Fin," because of the very fine texture of the flour made here. In the old days, when people brought their grain here to be milled and made into flour, one of the mills had the bright idea of making pancakes and serving them to the waiting customers. Then wine was added - and the next thing you know, these became party places. This one in particular was a wild party place. It was said that "Il se fripe plus de jupons qu'il ne se blute de farine" (more skirts are crumpled than flour is sifted). 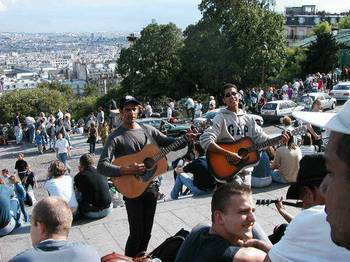 The steps of Sacre Coeur are loaded with all kinds of people on Sundays. The people of Montmartre were not particularly pleased when this church was built, because the Catholic Church did it to "expiate the crimes of the Commune." They were referring in particular to the bloodbath of 1871, in which the people of Montmartre got hold of Thiers guns -- they were disgusted with him for capitulating to the Prussians. Thiers sent soldiers up the hill to attack the rebels and the soldiers defected and joined the rebels. The citizens tried and executed a couple generals, then the Thiers government retaliated, lots of buildings were burned, the streets of this area were filled with dead bodies, and the whole thing was dreadful. 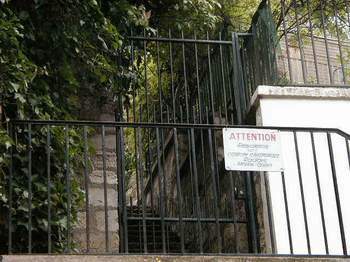 So it is no wonder that the people of Montmartre continued to worship at the old church, Saint Pierre de Montmartre (c. 1134), instead of this new one. 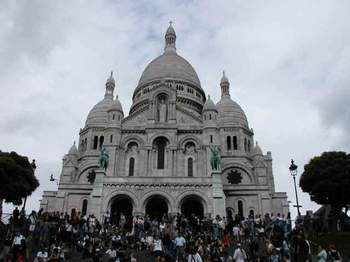 Sacre Coeur took a long time to build because money had to be raised. It was not finished until 1919. It has been a tourist attraction ever since. 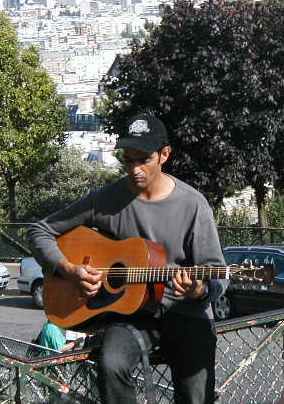 This guitarist was warming up, off to one side, on the crowded steps in front of Sacre Coeur. We recognized him from prior years. He is a speaker of Spanish, we think, and I don't think he knows much English or French. Must be tough to make a living this way. Here he is a little later, singing with a "confrere." They do a lot of British and American songs, including lots of Beatles tunes. When our friend sang Hotel California, I knew he didn't really know the words he was singing -- he just tried to make similar sounds. But they were both good, and the crowd was definitely entertained. The crazy old man behind and to the left of our friend the guitarist was dancing and strutting back and forth -- looking quite foolish and very funny. 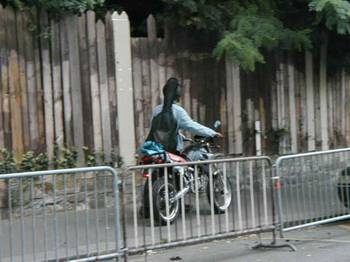 Later in the day, we saw our friend the guitarist leaving, walking his motor bike down the hill. Tom thanked him.